Alan suggestion's have changed my idea slightly and I now think the story works a bit better. 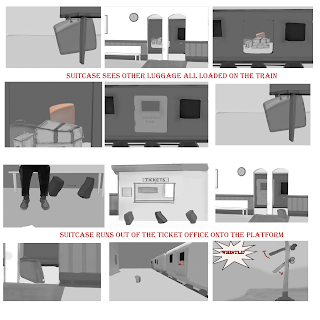 As suggested I've included a female suitcase which is already on the train. The lost luggage sees her and from then on is determined to board the train. Alan also suggested that I looked at making the animation in black and white. I couldn't decide whether or not to do this, I was worried it would be harder to get the characters across, so I've decided to go somewhere inbetween. 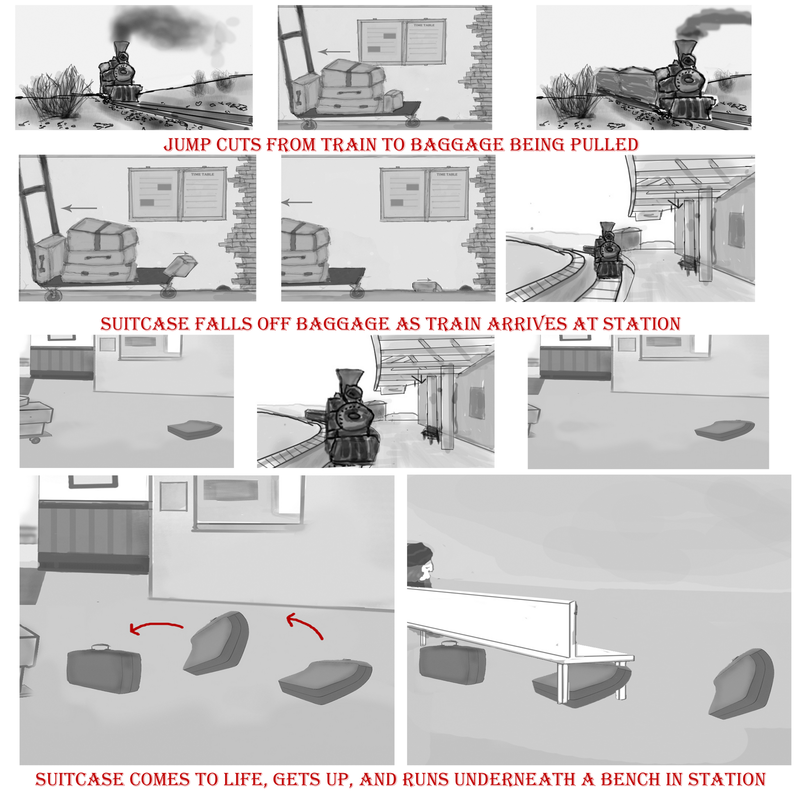 As the storyboards show, everything in the animation will be in black and white, except the female suitcase, who will be coloured (Pinkish) I thinnk this would make her really stand out and considering she is the aim and objective, it will make things really clear. It reminded me a bit of Schlinders List, with everything desaturated apart from the one red-coat. I wanted to build on the love-story part, I've got a copy of 'Brief Encounter' (Thanks again Alan!) and I'll try and replicated some of the shots and try and put across the genre. 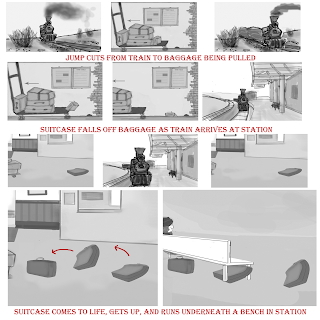 A couple of suggestions; firstly, it's absolutely essential that you establish the relationship between the 2 suitcases in the first sequence; if you're going to establish the narrative around their separation and ultimate reconciliation, they should be happily on the trolley together from the outset, and then the male suitcase gets bounced off; also, I suggest that if you made them 'honeymoon' luggage - i.e. with 'just married' on them somehow, the romance element would be further underlined, while also giving a whole logic to them travelling together and going on an exciting train journey; as is always the case with these kind of narratives, there must also be an escalation of activity, as the male suitcase's efforts to board the train grow in their elaborateness; thing about using other staples from different genres to help - for instance, the old horse and lasso chase scene; while I think Alan is right to get you to look at Brief Encounter for some visual 'homage' references, remember you're dealing with a Western more typically, so look to those conventions too. The basic thing is make sure you're referencing period detail throughout - and that includes for the designs for the trolly, the suitcases etc... make sure you keep within your own chronological rules; attention to detail is everything! A nice 'in between' to your colour problem could be Sepia toning. Remenisant of old Wild West photograpy perhaps? 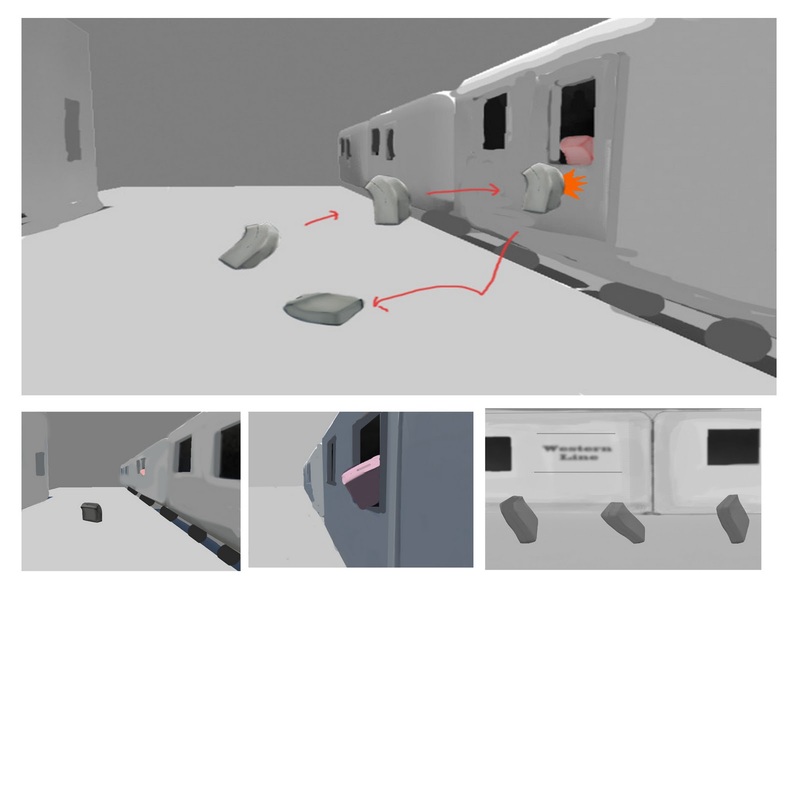 Regarding Brief Encounter - I meant for you to look at the key train / love scene only as a way to frame the camera and pose/animate your characters.